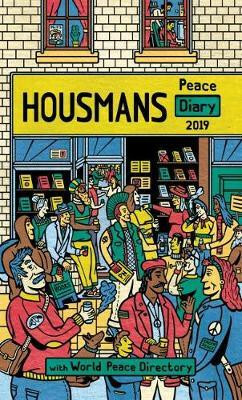 the world-renowned Housmans Peace Diary - this is the 66th edition. It includes a World Peace Directory listing almost 1500 national and international peace, environmental and human rights organisations from around the world. This year's special feature celebrates 60 years of the Housmans & Peace News building in London, and the wide range of fellow dissidents who've found a welcome here. It looks at the role of the building's denizens - and the building itself - in many areas of society and in various significant political events. The Housmans Peace Diary is a non-profit service to movements around the world working for peace, social justice and the environment. It's in pocket format, with a week to a view, and gives notable dates and anniversaries as well as a weekly quotation. It includes calendars, a forward planner for 2020 and space for notes. This year's cover designer is Phil Wrigglesworth.